This exquisite Chicken Fried Ribeye can be had at a Memorial-area restaurant that ranks highly in our year-end roundup. Read on to find out where. We made it. We have stumbled across the finishing line of 2016. There’s a bright new year ahead with fresh dining concepts just around the corner. Before those become all the rage, though, it’s time to take a look back and honor the best places enjoyed by Houston diners in the past year. Confession: by June of 2016, I was concerned about what the new restaurant scene was going to look like in Houston by the end of the year. At that point, things had gotten off to a slow start. Much of what was new were repeats of existing locations or casual imports from other cities. With oil and gas prices down—way down—many restaurateurs and investors were (wisely) not taking risks. That stalled the openings of creative, chef-driven concepts—and those are the types of places that help determine how a city is viewed in a culinary sense on the national stage. Now that 2017 is upon us, it’s pleasing to see in retrospect that 2016 actually ended up much better than expected. After the midpoint, the pace of interesting restaurant openings quickened. Riel from chef Ryan Lachaine (formerly of Reef and Underbelly)—is now open and specializes in Ukrainian and Canadian fare. The focus of forthcoming Xochi from the husband-wife team of Tracy Vaught and chef Hugo Ortega (with assists from award-winning beverage director Sean Beck and pastry chef Ruben Ortega, of course) is on Oaxacan cuisine. In other words, it seems that 2017 might get rolling with more of a bang than a whisper. Surprisingly—to me, at least—some of the best dining experiences I had this year were at places that aren’t getting nearly much buzz or recognition. This list will hopefully at least somewhat address that inequity. Speaking of buzz, there is a considerable list of honorable mentions—and do not take them lightly. Every single one is worth visiting. (the wonderful) Love Buzz, 412 Westheimer, Opened July 2016. 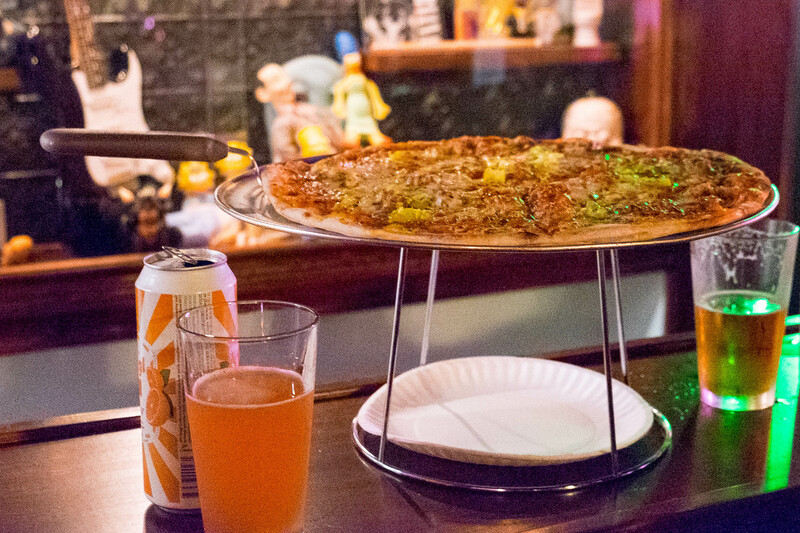 This Montrose hangout has an extensive enough food selection that it straddles the line between dive bar and pizza place—and does a darn fine job of it. From a Pee Wee Herman doll and other in a glass case to skee ball and video games in the back room, ‘90s memorabilia abounds. However, I bet no one was selling a Bloody Mary garnished with a slice of pepperoni pizza back then. Love Buzz is a place for grownups to have shots, cocktails and trashy pizzas (I mean the latter in the best way possible). There’s a pizza for every mood. Swing-shifters will want some Good Morning Wood (did we mention the menu is full of innuendo?) topped with bacon, cheddar, mozzarella, hash browns and a fried egg while hot heads will want the Pompieean Disaster with jalapeños, habaneros, chipotle flakes, smoked provolone, grilled chicken breast, bacon, Killer Bee Honey Hot Sauce and fresh lemon. Year-round, get a beer or mixed drink between 9 p.m. and 2 p.m. and receive a free slice of cheese pizza alongside. Conservatory, 1010 Prairie, Opened April 2016. The owners of Prohibition Supperclub brought Houston its first food hall—an underground one, no less. There diners will currently find kiosks for Melange Creperie, El Burro & The Bull, Myth Café and Samurai Noodle. There’s also an extensive selection of tap beer and regular special events, such as pint glass nights. Follow each restaurant individually on social media to keep up with their specials. El Burro & The Bull, for example, is regularly serving pozole on the weekends to ward off the chilly weather. Rise No. 2, 1700 Post Oak, #290, Opened June 2016. As much as Houstonians like to poke fun at Dallas, truth be told our traditional state rival has its own flourishing restaurant scene. Imports are welcome in Houston, but only if they bring something new to the table—sans the arrogance. Such was the case with Rise No. 2, an utterly charming restaurant on the second floor of BLVD Place on Post Oak. Who knew soufflés paired with a savvy selection of wine from France and the West Coast could be so adventurous? A fun fact: all of the enchanting décor items are for sale, even the tables, but no server would be so gauche as to ruin the dining experience by trying to sell something. If something catches your eye, just ask about it. 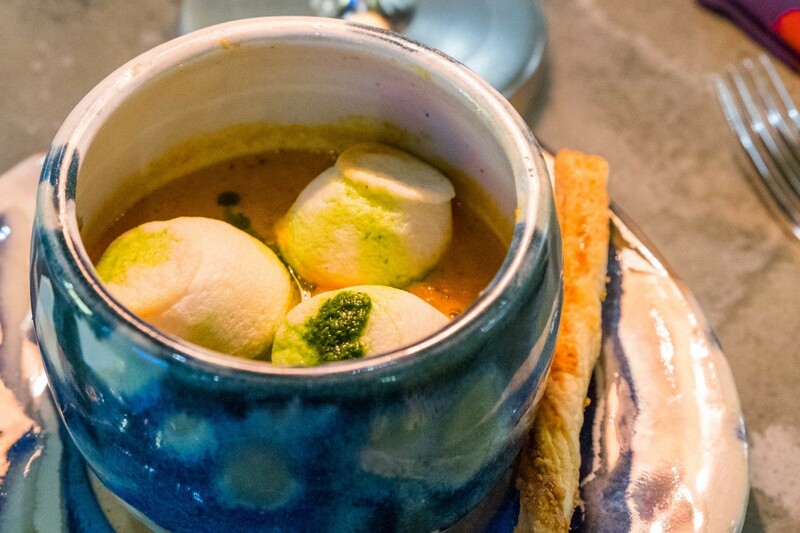 The “marshmallow soup,” a carrot-tomato bisque where mini cheese soufflés stand in as savory little puffs, and the warm chocolate soufflé are must-haves. 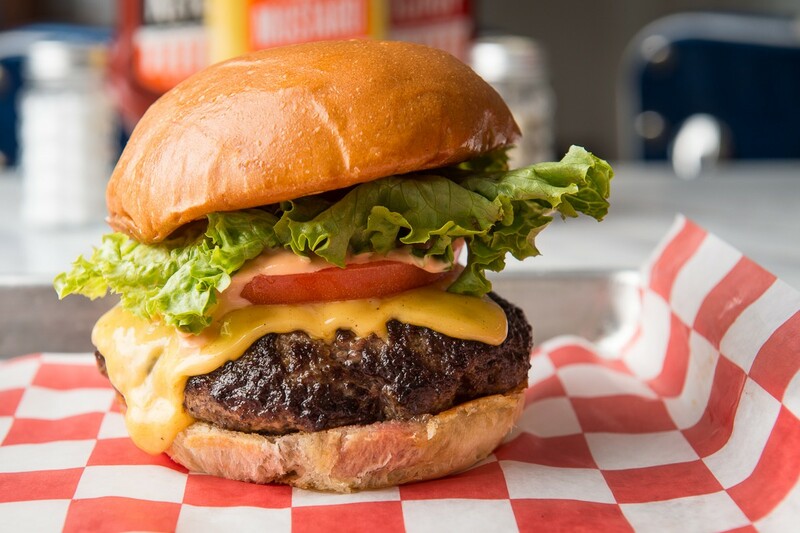 2016: The Year Of Even More Outstanding Burgers: Is there any city with more outstanding burgers than Houston? We think not and that situation hit ridiculously great levels in 2016. Other than perhaps an In-N-Out Burger, we’ve got it all. 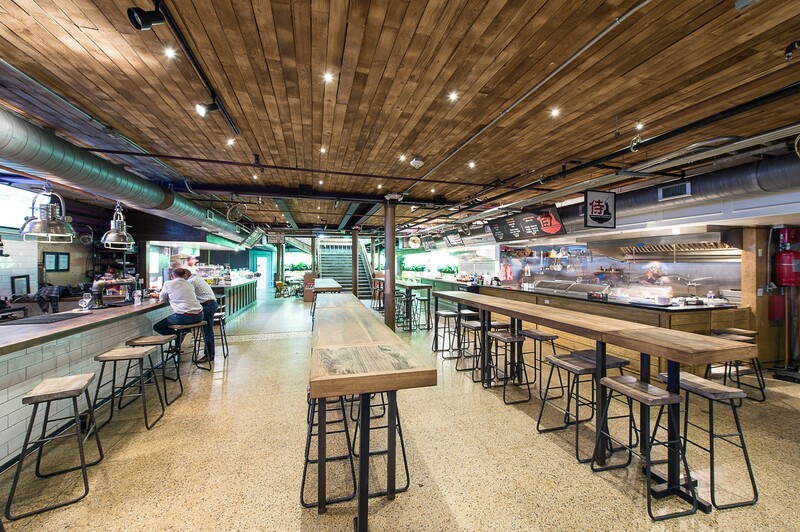 Former Oxheart line chef Willet Feng quietly opened Kuma Burgers in April 2016. It’s located in the better-than-it-had-any-right-to-be food court at 5 Greenway Plaza, also the home of Greenway Coffee and The Rice Box. In May, out in Pearland, Ronnie Killen started his most challenging project to date: a burger joint. You can’t please all the people all the time, but I was utterly smitten with my hearty, medium rare, picture-perfect specimen from Killen’s Burger. The fries were tender and salted just the way I like them, too. 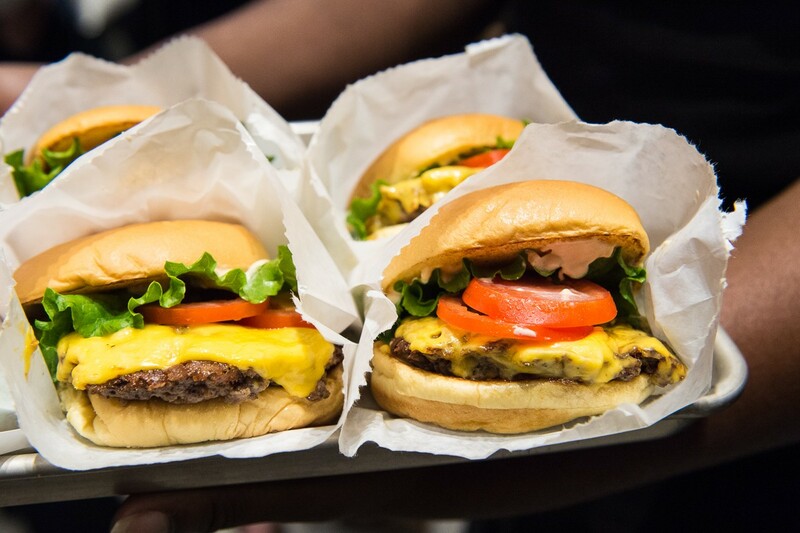 In November, Houston was finally granted a Shake Shack location at the Galleria. 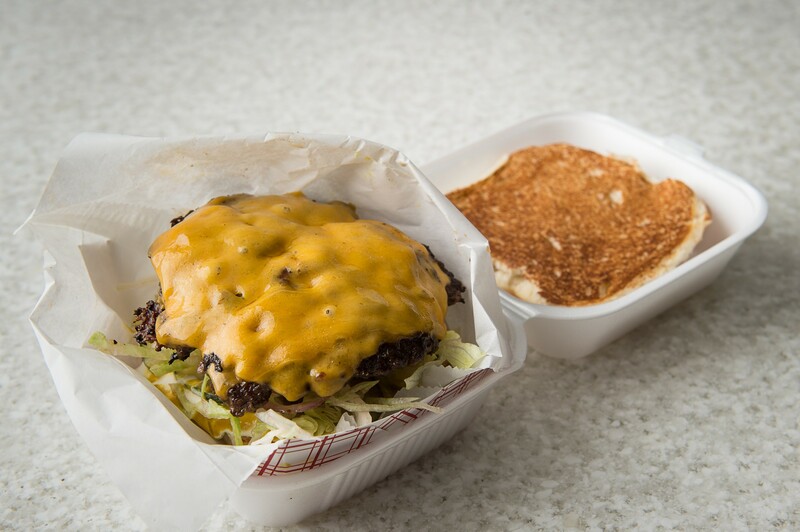 Since it hails from New York City, we wanted to only begrudgingly like it, but the truth is that even just the basic Shack Burger, its patty enrobed in melting cheese, is actually quite good. We further admit that we were flattered and touched that the company reached out to small local businesses, like Fluff Bake Bar and Morningstar, to create food items with a Houston touch. Five percent of the sales of the Vietnamese Coffee and Donuts Concrete (with Morningstar cinnamon-sugar aka “cop doughnuts” and Greenway Coffee) goes to the Houston SPCA. The last of our honorable mentions are all casual concepts that aim high and succeed. Cane Rosso brought to Houston dog-friendly pizza places in The Heights (1835 North Shepherd, Opened June 2016) and then Montrose (4306 Yokum, Opened October 2016) in rapid succession (owner Jay Jerrier even runs a dog rescue organization), not to mention new options for true Neopolitan-style pizza. The softer, more malleable crusts, as tradition dictates, may not be to everyone’s tastes but for those who do like them, Cane Rosso’s quality and meticulous preparation is undeniable. In May, David Buehrer of Greenway Coffee and Blacksmith teamed up with his former employer, Sam Phan of Donald’s Donuts, to open Morningstar (4721 North Main), his most full-fledged establishment to-date. To call it a coffee and doughnut shop would belie the most interesting parts, which includes a savory menu of barbecue-filled kolaches and West-coast inspired rice bowls, as well as the city’s most inspired matcha tea program. Disclaimer: Houston Food Finder currently sports a Morningstar ad, but you don’t have to take our word for it. You can take this one. Or this one. Last, but not least, the owners of Peli Peli proved that South African cuisine translates quite well to casual dining with Peli Peli Kitchen (9090 Katy Freeway). (That was without any help from would-be investor Elizabeth Blau, thank you very much.) 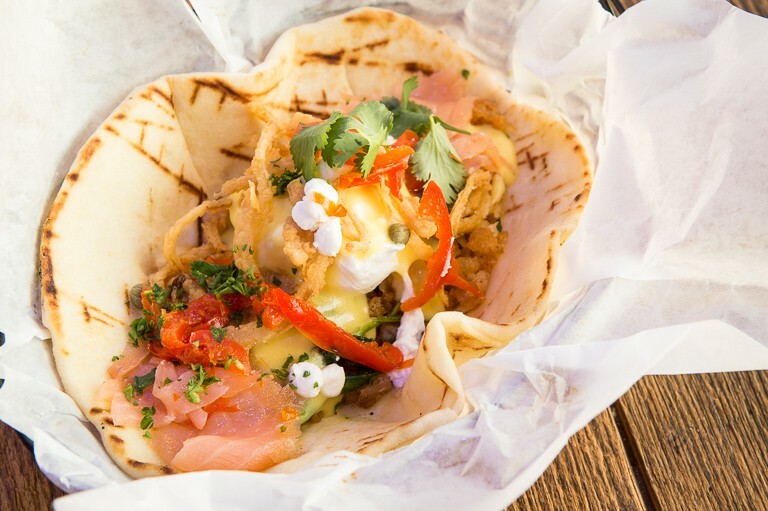 Items like the salmon stuffed “taco,” where Indian naan stands in for a tortilla shell, and rotisserie chicken infused with the African bird’s eye chili known as “peri peri” (or “piri piri”), are daring yet make perfect sense. Now it’s time for our list of Best New Houston Restaurants of 2016. It just warms the cockles of my heart (look it up) to see Houston’s hardest-working pizza guy, Anthony Calleo, in a brick and mortar after years of slaving away in a food truck. The funny thing is that Pi Pizza now has so many interesting facets that suddenly pizza is only one of several aspects that merit discussion. How about a cocktail program that includes the tiki-esque Pineapple Express, with tequila, mezcal, cinnamon, pineapple juice and a bit of cayenne for some snap? There’s an extensive bottled cocktail collection, too. How about those deep-fried, tender-crusted macaroni and cheese balls? Just when you think that Brussels sprouts have been done to death, here comes Pi Pizza with an idealized rendition that includes stanch blue cheese from the Houston Dairymaids, fennel pollen and Mike’s Hot Honey. 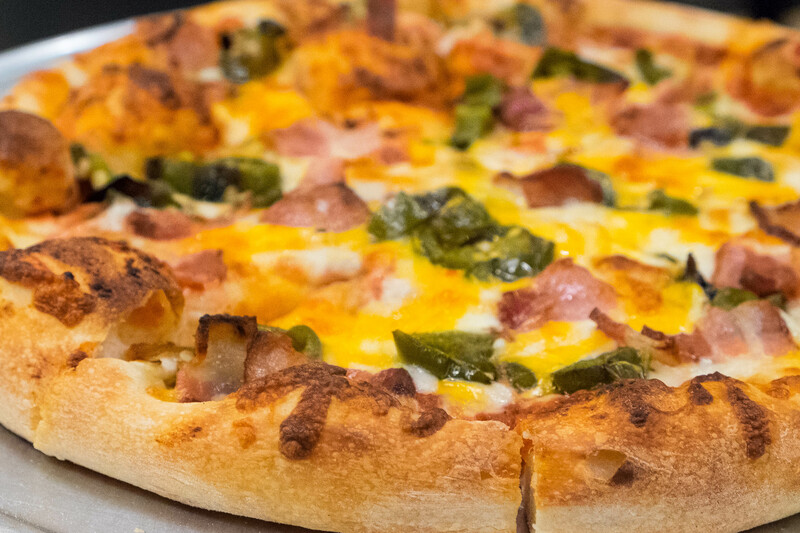 When the phrase “Many happy returns” was invented, it could have referred to what’s possible for diners who visit Pi Pizza. A table-full of delights at Relish. 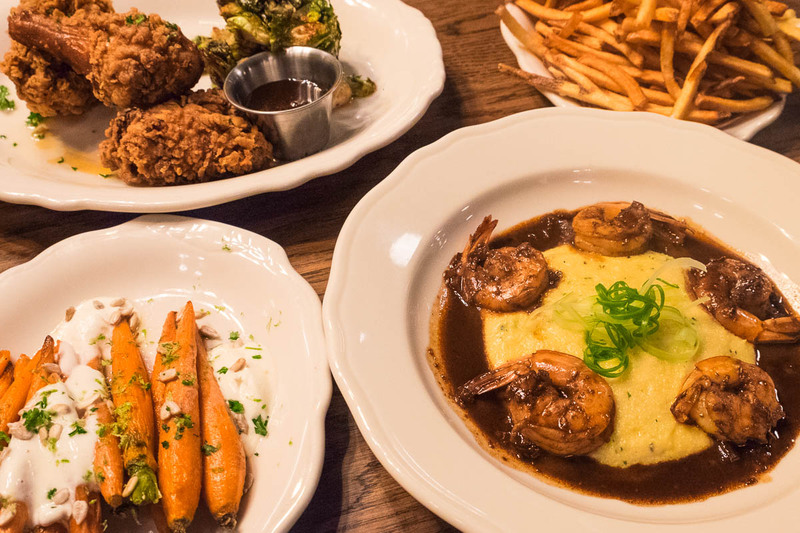 Clockwise from upper left: fried chicken with “hot honey” and maple Brussels sprouts; handcut french fries; New Orleans-style barbecued shrimp and glazed carrots with créme fraiche, lime zest and sunflower seeds. 9. Relish Restaurant & Bar, 2810 Westheimer, October 2016. Relish is the best restaurant no one seems to be talking about. It’s a bigger, better, classier reincarnation of the former fast-casual spot on San Felipe, which is now closed. Current construction on Westheimer is doing it no favors (what else is new) but brave those foreboding orange and white markers. If you don’t, you will miss out on an approachable, well-executed menu of Southern favorites that isn’t afraid to pull in the occasional Italian dish. New Orleans Style Barbecue Shrimp on top of polenta is tangy with tongue-tingling lemon and Worcestershire-infused sauce. Like Brussels sprouts, beet salads are often in danger of being the old saw on restaurant menus, but Relish’s version is like a plate of big yellow and red gems accented with watercress, crushed pistachios, lemon vinaigrette and a mild, cool blue cheese cream. (Can we all agree that it’s time for watercress to make its big comeback?) The big, glassy space and long marble bar counter are visually welcoming, too. 8. Eloise Nichols Grill & Liquors, 2400 Mid Lane, #100, Opened October 2016. Be forewarned that the noise levels at Eloise Nichols can get quite—er—“spirited.” The food, though, makes it quite worth the inconvenience of leaning over and talking in your neighbor’s ear to be heard. It was here that we had some of the finest oysters—briny, meaty and blessedly grit-free. Dishes like Joe’s Hot Chicken and the housemade venison sausage feel like contemporary but homey classics. As the name indicates, cocktails are competent, and yet uncomplicated. The Marlboro Man, for example, only has three ingredients: rye whiskey. turbinado. and bitters concoction. What more do you need? 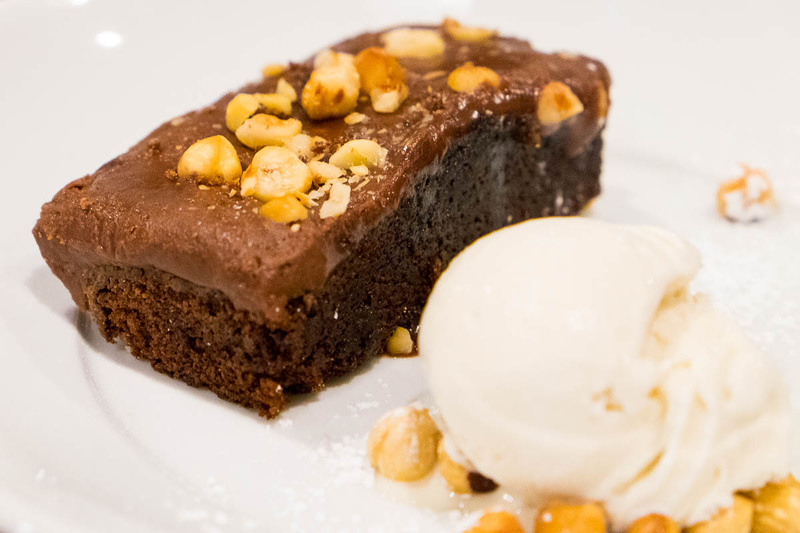 Have a fork ready at dessert time and get your fair share of the Hazelnut-Chocolate Cake. The Butcher’s Cut at Ritual (in this particular instance, a 44 Farms New York strip). 7. Ritual, 602 Studewood, Opened June 2016. Who would have ever guessed that the former El Cantina Superior spot would have been utterly reincarnated as a prime spot for Texas-raised meats and reinvigorated classic Southern dishes? Well, apparently Ken Bridge (of Delicious Concepts, the company that tried to make the prior concept a success) and Felix Flores of Black Hill Meats. Ritual got off to a shaky start—any restaurant owner should quake in their boots over the prospect of three chef changes in as many months—but despite the turnover, it still managed to keep cranking out one interesting dish after another. The Butcher’s Cut is consistently an outstanding value (more than once it’s been a New York Strip from 44 Farms) and spice lovers will dig the Angry Bird, which doesn’t hold back on the cayenne. On the veggie side, the Ritual Roughage, a seasonal blend that currently includes sustainably harvested lettuce, cucumber, radish, sweet herb, onion and croutons tossed in lemon-feta vinaigrette, sets a higher standard than usual for salads. Bubbly-edged, browned pasta is a surprising and welcome touch on Arthur Ave’s lasagna. 6. Arthur Ave, 1111 Studewood, Opened July 2016. Like Ritual, Arthur Ave had some bobbles getting out of the gate, but it’s been rolling along just fine for a few months now. This is a great place for sharing a big, meaty plate of Sunday Gravy with friends or commandeering a pasta dish all to yourself. The incredible, crispy-edged lasagna is the must-try here; every layer is cooked and placed individually with care. Pasta is always perfectly cooked and favorites include the penne alla vodka as well as the Fusilli Alfredo, touched with a bit of lemon zest for brightness. 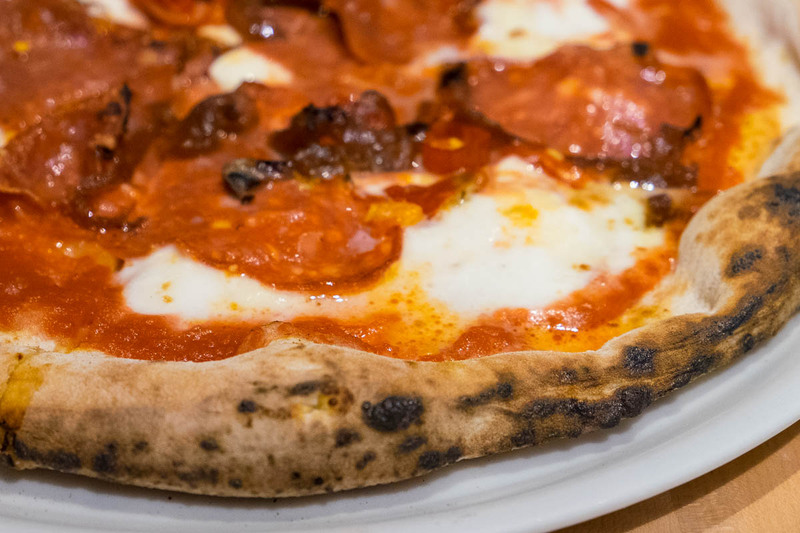 Diners who love their pizzas with a bit of heat should aim for the punchy fra diavola with mozzarella, spicy salami and basil. 5. The Pit Room, 1201 Richmond, Opened August 2016. Our barbecue columnist Scott Sandlin declared The Pit Room as the best new barbecue place—and part of his list of the best barbecue in Houston overall. Having tried it, I’ll vouch for it, too. One of the things that impressed me the most is that they keep the pits going constantly and keep plenty of meats ready. So, when I wandered in after 7 p.m. one night, there was still plenty to choose from: moist brisket, beef sausage with a good snap (which is made in house, a feat that few barbecue restaurants have time and resources to accomplish) and pork ribs. Everything tasted freshly made as well. What really sets The Pit Room apart, though, is the little things. Many of the finer touches come from a “waste not” mentality—house-pickled green onion stems and rich, tender tortillas made with rendered brisket fat, for example. Those who want to deviate from the norm might delve into a brisket-laden Frito pie or one of the pulled pork tacos. 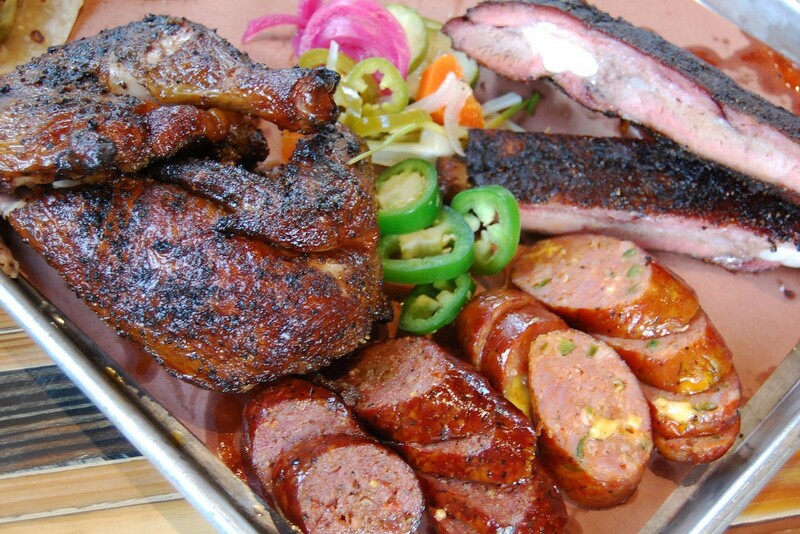 Truly, top-quality Texas barbecue has arrived inside the Loop. 4. Brasserie 1895, 607 South Friendswood Drive #11, Opened August 2016. Chef Kris Jakob was always the steady, guiding hand at the student-staffed Kris Bistro inside Culinary Institute LeNôtre. That guiding hand is now at work in an attractive neighborhood restaurant in Friendswood. Jakob’s sense of adventure manifests itself in a variety of ways, whether it be pulling together a pitch-perfect rogan josh (with lamb, red lentil dahl spread, cilantro lime chutney, roasted coconut and housemade naan) or a surprisingly elegant chicken fried steak. Ask about the “Galveston Day Boat” catch or the Texas Ranchers special. Being a locavore can be as tasty as it is conscientious. 3. State Fare, 947 Gessner, Opened May 2016. 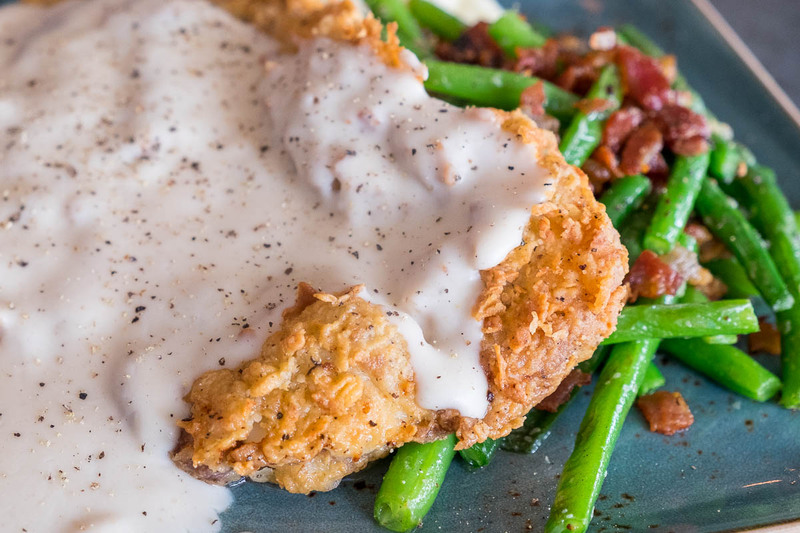 You’d think that Houston would be rolling in outstanding chicken fried steaks, but that’s not the case. It’s rather shocking, actually, how few truly exemplary ones there are. 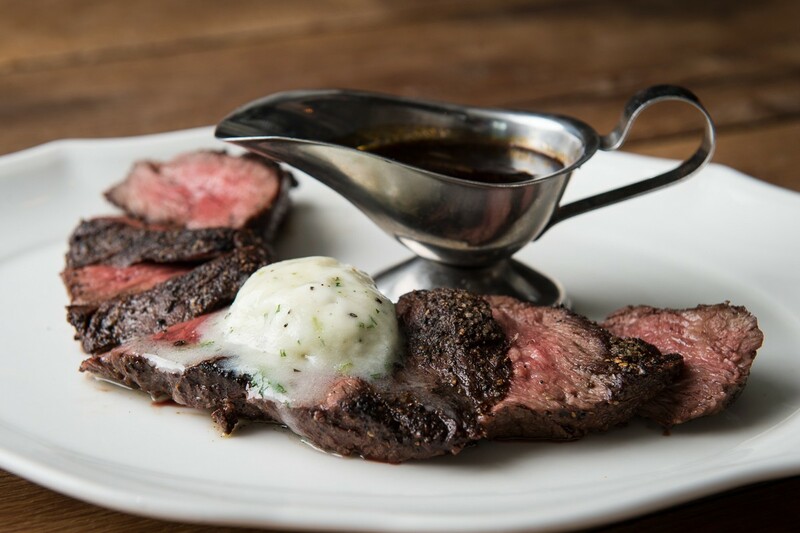 State Fare chef Jim Mills is serving one of the best to be found within city limits: crisp yet tender seasoned crust and white gravy (as is only proper) enrobing a tender ribeye with a tasty—but not overwhelming—edge of fat left on it. That said, no place ranks this highly for a single dish. It’s just the tip of the iceberg. 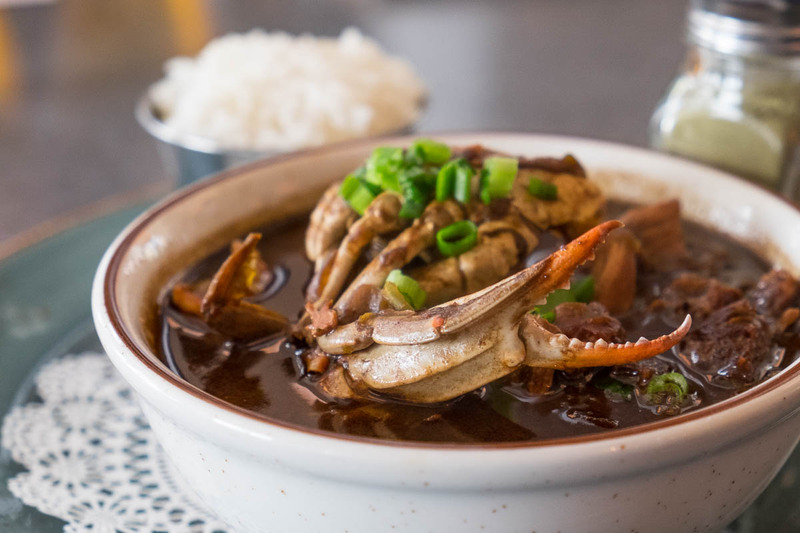 We could instead talk about the rich, deep roux of the seafood gumbo, which rivals the lofty examples at places like Danton’s, Holley’s and Brennan’s of Houston. Or, we could discuss Laurie Sheddan’s thoughtful cocktail program—the best on the west side of Houston. The frozen Lee’s Rum & Root Beer is fun and addictive, with herbal notes from the Italian amaro Averna adding interest and depth. (Make it your own and add a shot of Fernet Branca, Fernet menta, spiced rum or Cocchi Torino for a dollar.) State Fare hits the delicate balance of elegant but casual needed for the location, which should earn loyal patrons for years to come. 2. Killen’s STQ, 2231 South Voss, Opened November 2016. Really, what we all want from a dining experience is a meal that makes us say, “Whuff! That was good!” Killen’s STQ is the fourth restaurant in Ronnie Killen’s empire—but the first in Houston instead of Pearland. It is the one that is set up to finally show the world that Killen is not just a barbecue guy, or a steak guy, or a burger guy. He is a Cordon Bleu-trained chef; one who has cooked at the James Beard House more than once. If you think you “like” the creamed corn and giant beef ribs at Killen’s Barbecue, just check out the new spins at Killen’s STQ. Here, it’s a beef short rib with an espresso rub and the creamed corn is baked in a little metal dish with shaved Parmesan on top. 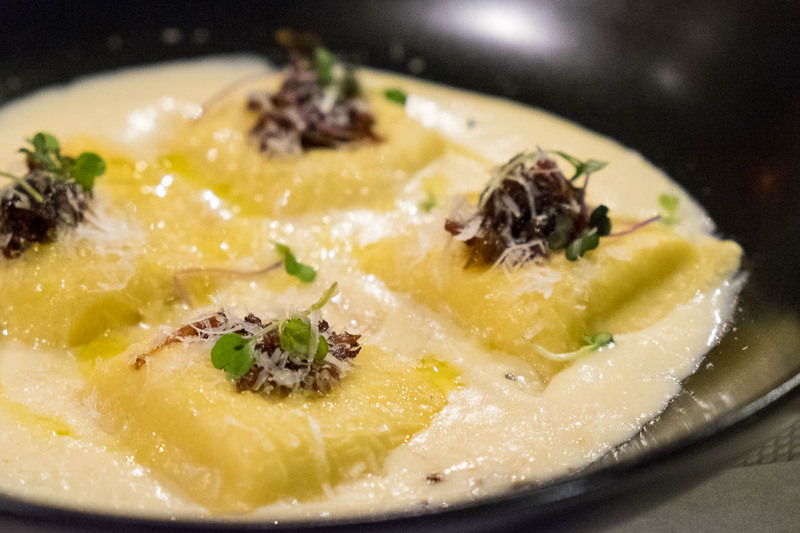 My favorite dishes, though, happen when Killen is at his most “cheffy,” such as the Roasted Corn Ravioli with Corn Milk and Bacon Jam. The next time I visit, though, I’m lingering over a warm bowl of Coastal Hay Smoked Tomato Bisque, adorned with grilled cheese wedges. It’s the ultimate comfort food. 1. 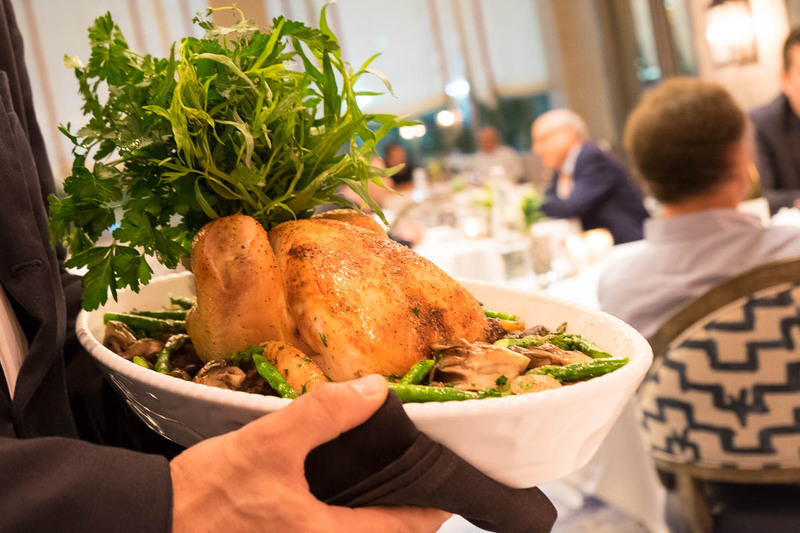 La Table, 1800 Post Oak, Opened February 2016. No one blew a horn across the mountains to announce that the former Table On Post Oak has finished transforming into La Table. It was a quiet transition, at least until Houston’s food media started wandering in to discover a vastly improved venue. I’ve never had less than a note-perfect meal and service here. More telling, I’ve never even spoken with anyone who had a complaint about La Table. Even the most lush presentations at the fine dining restaurant, Château, like lamb chops wheeled out on a silver cart and carved tableside, seem fairly priced for the quality of the dish. That’s only one part of La Table, though. Marché, the downstairs dining room, can be as fancy or un-fancy of a dining experience as you want it to be. Have a quick lamb burger or work through the exceptional raw bar offerings, which include oysters, salmon tartar and an exemplary colossal lump crab cocktail. La Table even takes care of the grab-and-go crowd with its bakery counter, Macarons. Take a corn and jalapeño kouglof to go or treat the office to a crowd-sized apple tart. Truly, La Table has something for everyone, and it’s all with a dose of top-notch service.